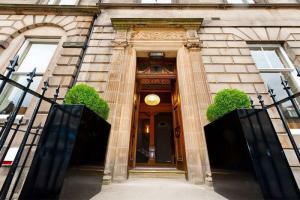 With a central location on York Place, and housed in a beautiful Georgian building, this hotel offers comfort and value in the heart of Edinburgh. The hotel is a short walk from the Edinburgh playhouse, and puts the the city's shopping and entertainment at your doorstep. Guest accommodations range from singles to suites, offering contemporary styling and modern amenities. Four literary-themed suites, each featuring a bespoke library, celebrate Edinburgh's designation as the world's first UNESCO City of Literature. The hotel is approximately 10 miles from Edinburgh airport (about a 25-minute drive). The Edinburgh tram, with service from the airport, stops right outside the hotel.